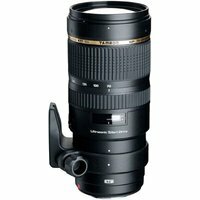 The Tamron 70-200mm f2.8 SP Di VC USD Lens Canon Fit is a high-speed telephoto zoom lens with an Ultrasonic Silent Drive that achieves leading-edge image quality while boasting the most compact design in its class. The USD (Ultrasonic Silent Drive) delivers speedy AF (Autofocus) and the moisture-resistant construction helps keep the rain out. The design features 23 elements on 17 groups, including four Low Dispersion glass elements for minimising chromatic aberration. Vibration Compensation provides a stable viewfinder image with excellent tracking performance. The 'SP' in the title indicates it is one of Tamron's top-line Special Performance' lenses and Di' stands for Digitally Integrated which means this lens can be used on cameras with full frame and APS-C sized sensors.